Breakfast Ice Cream. Yes, you’ve heard right. Breakfast Ice Cream. You’re welcome. 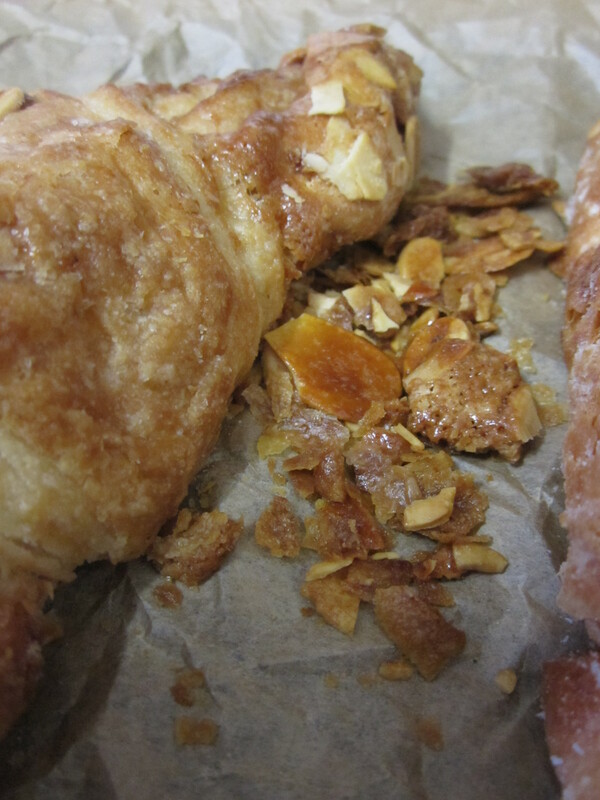 Toasted Almond Croissant Ice Cream. Chewy, Nutty, Creamy. Dreamy. Who says that you can’t have a scoop or two of this beautiful ice cream for breakfast when the days are starting to heat up this Summer? That is if we get a Summer! This is a really nice way to use up any spare almond croissants you might have lying around, ok so you might need to buy or make some extra croissants to make this ice cream. 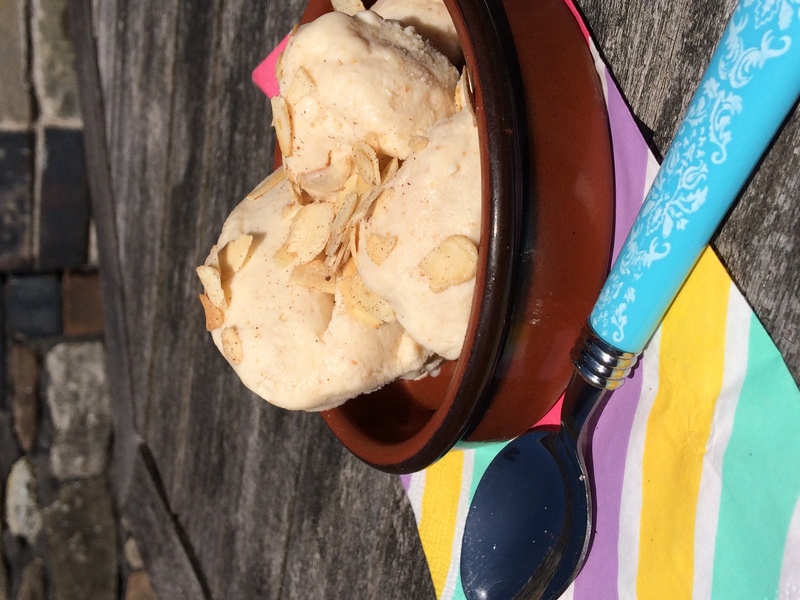 I added a touch of my dad’s honey to add a light floral note to the ice cream as well some toasted flaked almonds with a pinch of warming cinnamon to scattered over the top for some crunch. What are you waiting for? It’s getting hot out there…so make this ice cream! Oven to 160C. Place the croissants on a baking tray and toast in the oven for 15 minutes or until golden brown to allow the toasty nutty flavour out. 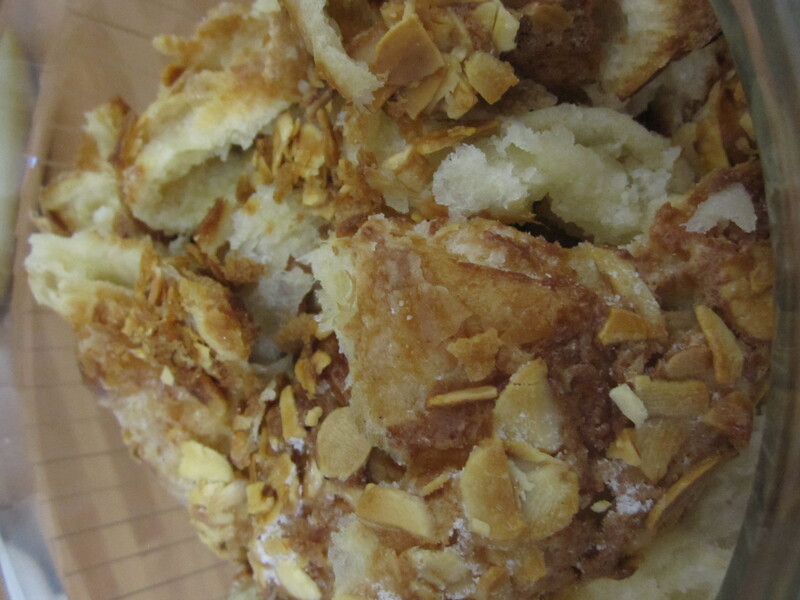 Tear up the croissants and add to a large bowl. Place the milk in a medium-sized heavy saucepan and heat on medium-high until the milk begins to just boil. Pour over the croissants. Cover with cling film and move to the fridge to soak overnight. Once been soaked, use a stick blender to blend the mixture smooth. Decant the milk into a medium-sized heavy saucepan, through a fine sieve to remove any bits to make a smooth ice cream. Add the double cream, sugar and honey to the milk. Heat on medium-high with occasional stirring. Whisk the cornstarch with the 4 tablespoons of milk. Once the milk starts to boil, quickly whisk in the cornstarch and whisk vigorously until the mixture begins to thicken. Boil for 1 to 2 minutes or until the ice cream base has acquired a thick custard like consistency. Remove from stove and transfer the ice cream base to a bowl. Chill over an ice water bath completely for about 35-40 minutes. Pour the ice cream base into a pre-frozen chilled bowl of your ice cream maker and churn until soft-set. Transfer the ice cream into a freezer-proof airtight container and freeze for at least 6 hours, preferably overnight before serving.When ready to serve, in a dry frying pan, lightly toast the flaked almonds with a pinch of cinnamon. Scatter over the scooped ice cream and tuck in!